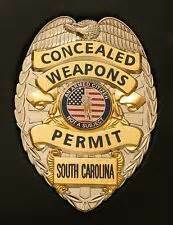 Firearm instructors of the Batesburg-Leesville Police Department offer Concealed Weapons Permit courses to citizens of the Batesburg-Leesville community. For a nominal fee of $50, any qualified citizen can receive the training needed to meet the requirements to apply for the South Carolina Concealed Weapons Permit (CWP) through the South Carolina Law Enforcement Division. CWP training consists of preparing required documents, classroom instruction, and a firearms qualification that is required by South Carolina State Law. The proceeds that are received through the South Carolina Concealed Weapons Permit (CWP) Course are used to fund future community and department-based educational programs that are managed by the Batesburg-Leesville Police Department. For more information regarding future CWP courses offered by the Batesburg-Leesville Police Department, please contact Captain Walter Goss at (803) 532-4408 or by email at wgoss@batesburg-Leesville.org.